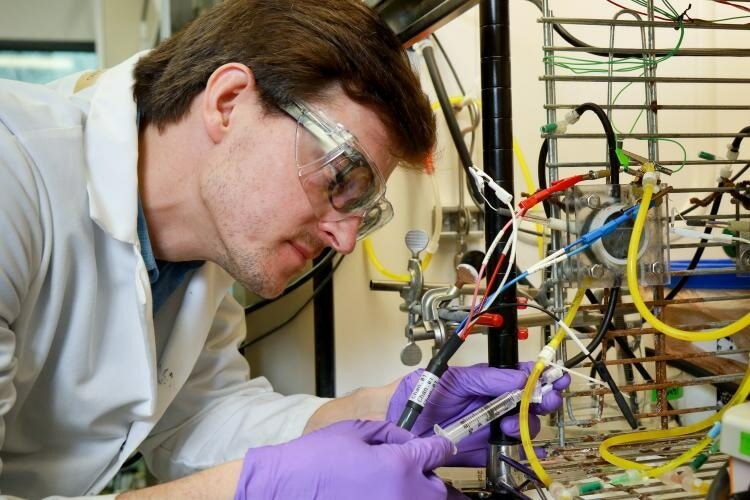 A team of researchers from the Department of Energy’s Oak Ridge National Laboratory have developed a new process that recycles wastewater from biofuel production to produce hydrogen with the main ingredient being “electrical” bacteria. The hydrogen can later be used to convert bio-oil into higher grade liquid fuels such as diesel or gasoline. “We are solving multiple problems at the same time,” said ORNL researcher Abhijeet Borole, who headed a multi-year project to create the system. The lab-scale demonstration by the team could create 11.7 liters of hydrogen daily at rates that are essential for industrial applications. Borole observes that even though additional work will be needed to take this technology to the commercial scale, their progress shows the potential of microbial electrolysis to make bio-refineries more efficient and economically feasible. Similar to a conventional petroleum refinery, the bio-refinery concept aims at conversion of plant materials into higher value products, including chemicals and hydrocarbon fuels. Microbial electrolysis happens with the aid of electrogens – bacteria that digest organic compounds and produce an electric current. Borole used these bacteria to help breaking down organic acids in liquid bio-oil that is created from plant feedstocks such as switchgrass. Typically, approximately a quarter of the liquid bio-oil is contaminated water that comprises of corrosive acids. We are taking this waste, which can be 20 to 30 percent of the biomass that you put into the process, making hydrogen from it and putting that hydrogen back into the oil. The hydrogen produced from the microbes could displace the necessity for natural gas, which is used later in the manufacture process to upgrade bio-oil into more appropriate drop-in liquid fuels. You can recycle the water, produce clean hydrogen and eliminate the natural gas. The researchers developed a process to evolve and enhance a hardy bacterial community that could tolerate the lethal compounds in the biofuel wastewater. This delicate balance also involved enhancing the total process and system parameters to enable the bacteria’s accomplishment. You are trying to efficiently extract electrons from hundreds of compounds and make hydrogen. How do you do that when the plant byproducts are poisoning this bacterial food? You have to find a way to negate or neutralize that poison and be able to produce those electrons at the same time. In this case, the bacterial poison is in the form of products produced by the degradation of lignin, a strong polymer found in plant cell walls. But understanding how to construct and enhance microbial electrolysis systems that can tolerate and treat contaminated wastewater could have advantages beyond biofuel production. “These systems have potential for wide-ranging applications, including energy production, bioremediation, chemical and nanomaterial synthesis, electro-fermentation, energy storage, desalination and produced water treatment,” said Alex Lewis, a doctoral student with the University of Tennessee’s Bredesen Center for Interdisciplinary Research and Education. The research team is presently focused on finishing a life-cycle analysis for the technology to assess its water use and greenhouse gas emissions. The team’s current paper is published in Sustainable Energy & Fuels as “Proton Transfer in Microbial Electrolysis Cells.” DOE’s BioEnergy Technologies Office and ORNL’s Seed Money program funded the project.